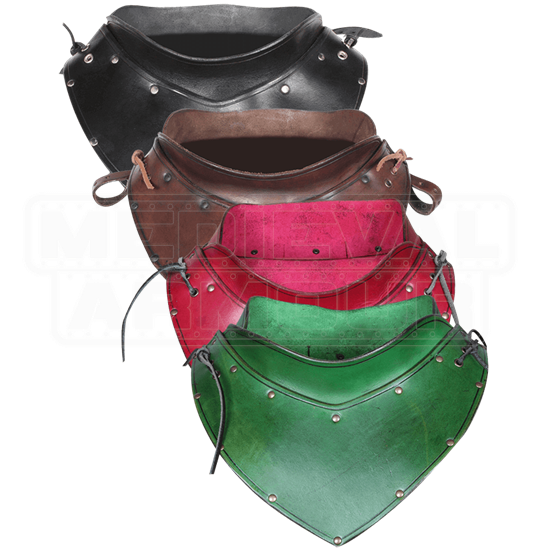 Save your own neck in battle when you work the Titus Leather Gorget into your armour ensemble. This handcrafted leather neck guard sports a triangular bib, slightly flared collar, and straps for attaching a variety of pauldrons. A versatile addition to historic and fantasy armour sets, adjustable leather cord at each shoulder fastens this armour piece in place, making it ideal for LARP and light combat. Rivets along the classically embossed edges grant the leather gorget just enough detail and, coupled with its all-over antique finish, make it ideal for a variety for medieval, fantasy, and Renaissance themed occasions.